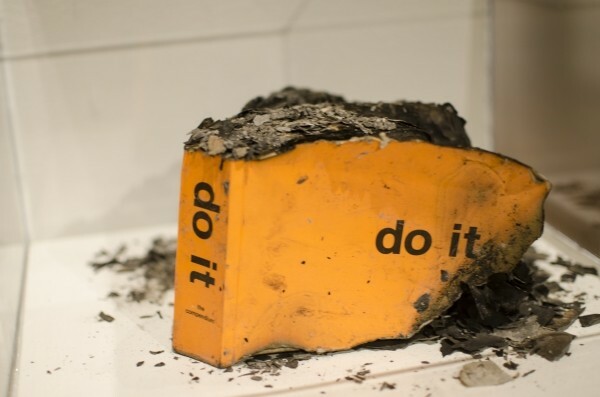 A burned instruction book from UMOCA's do it. You might be taken aback when one of the first things you see in an art exhibition is lingerie hanging on the wall. But, perhaps more than anything UMOCA has ever produced, do it— the newest exhibit in the Utah Museum of Contemporary Art’s main gallery—calls into question everything about art: not just what art is, but the process by which it is made, who and what an artist is, and the roles of the curator and the viewer. The idea for the traveling exhibition was generated from a conversation two decades ago between French artists Christian Boltanski and Bertrand Lavier and Swiss curator Hans Ulrich Obrist. They were tossing around the idea of an exhibition format that was open-ended and could travel and transform itself, being realized differently in each location. Obrist—co-director of exhibitions & programs and director of international projects at London’s Serpentine Gallery—hit on the idea of soliciting instructions from a number of artists that would be carried out at each individual gallery space. The exhibition eventually grew from a dozen original artists to more than 75, and has traveled to more than 50 stops. UMOCA selected 51 of the participating artists for its re-enactment of the project. Many of the artists who contributed instructions are figures who have had a significant hand in shaping contemporary thought and culture: pop-culture novelist Douglas Coupland; British pop-art icons Gilbert & George; the late noted minimalist Sol Lewitt; art critic Lucy Lippard; even Yoko Ono. Some of the instructions are as deceptively simple as “Start a rumor” or “Doodle.” Others contain detailed directions for projects such as making a painting, setting up a surveillance camera or squeezing as many bodies as possible through a doorway simultaneously. Martha Rosler shared recipes for drinks and meals that have Coca-Cola as a main ingredient. For Felix Gonzalez-Torres’ “Candy Pile,” the museum contacted the Salt Lake City-based Taffy Town. “We wanted to tie the show back to Utah as much as possible, or collaborate with other organizations as a way to connect the show to the community,” Maksym says. It was difficult to find a deciduous tree with leaves still on during Utah’s cold season, so for the “wish tree” in Ono’s “Wish Piece,” UMOCA borrowed a ficus from local shop Cactus and Tropicals. Other pieces explore the paradox of being commanded to resist conformity. Michael Smith’s “How to Curate Your Own Group Exhibition”—with its “fake exhibition lineup press release”—suggests a cynicism about the art world. Maksym says the show has been successful so far, which she believes is due to the combination of finished projects and more interactive works. “I think the public enjoys the DIY aesthetic of the show, as it sort of demystifies the presence and importance of original artwork,” she says. “Some of the works, such as the wish tree or candy pile, require the interaction of the audience to be ‘created.’ The art functions only when there’s active participation between the artist’s idea and the audiences’ experience of, and response to, that idea."